Below are all back issues of Silver Hydrosol Update, which you can subscribe to from this site. July 31, 2018 -- Having trouble losing weight? This Dr. Fung video solved the mystery for me! May 14, 2018 -- May BOGO Buy One, Get One Free Colloidal Silver Hydrosol Sale! May 09, 2018 -- May BOGO Buy One, Get One Free Colloidal Silver Hydrosol Sale! May 06, 2018 -- Is Autophagy a way to prevent or cure cancer? January 11, 2018 -- Just made a page featuring all of our testimonials....take a look? September 17, 2017 -- GREAT NEWS! We are OPEN! Shipping orders this week! June 08, 2017 -- We Now Accept Bitcoin, Ethereum, and Litecoin for Payment! June 07, 2017 -- Summer Sale - Buy 2 Half Gallons, Get 1 FREE! Plus more! May 24, 2017 -- Blog Post - What is the Meaning of Life? May 03, 2017 -- Natural Health Care Blog now on our site! February 03, 2017 -- Check out this special! 3X Half Gallon Jugs + 2X Empty Bottling, Sprayers, Droppers $119! December 27, 2016 -- Please watch our first new video for our Connected Happiness project? October 28, 2016 -- An amazing testimonial we just received today! This is why we do what we do! 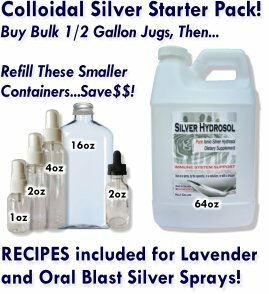 September 14, 2016 -- Colloidal Silver Starter Packs - Sprayers, Flasks, and Droppers + Savings of 25%! February 23, 2016 -- Money Saving Changes To Our Product Lineup PLUS Learn To Make Your Own Colloidal Silver Sprays! May 22, 2015 -- Memorial Weekend Sale - 3 Deeply Discounted Specials! April 12, 2015 -- Silver Hydrosol April Spring Sale! Save 20%! March 30, 2015 -- Silver Hydrosol Sale Ends Tomorrow! Buy One Half Gallon, Get BreatheEasy FREE! March 06, 2015 -- Silver Hydrosol Update, Issue #001 -- Thanks To Our Customer Family!